NRS Guide Gloves have undergone a lot of redesigns over the years; mine were the older style with metal retainer loops (which rusted, so good riddance). These were great gloves, with a simple design and minimum of features. They’re thin, which makes them brilliant for hot weather paddling, but the wind cuts right through them when they’re wet, making them poor choices for older conditions. The thin fabric caused mine to start failing after about two years of extremely heavy use. I’d still recommend them for summer paddling for excellent blister and sun protection. On paper, these gloves seemed like the best alternative for the NRS gloves…until their wrist reinforcements/hems started to rip after less than a month of use. I adore my Stohlquist Rocker PFD and many of their other products, but these gloves struck me as shoddily made. A suggestion, Stohlquist: Love the minimalist build in principle, but please, put reinforced grosgrain webbing loops or velcro clasps around the wrists. Pulling on the seams themselves to get them on causes rips. Other manufacturers add them for a reason! For what it’s worth, they were more windproof than the NRS Guide Gloves, and the seam placements on the palms weren’t bad, resulting in good blister protection. Given that these are water gloves, however, I found the terrycloth patch on the back of the index finger to not be very handy, as it’ll always be wet. Good for runny winter noses, though. These are my general purpose paddling gloves of choice. 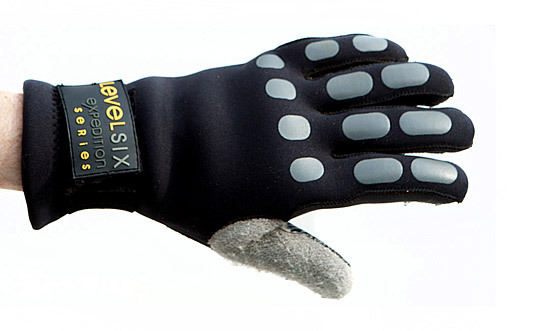 Designed as sailing gloves, they get a lot right for paddling use. They don’t have stitches where the paddle contacts the meat between your index and thumb; in fact, they have an extra layer of synthetic leather. That materials covers the palm as well, surely intended for rope and rigging work, and grants confidence when landing on mussel-encrusted rocks and other pointy aquatic destinations. The fingers themselves are a lot longer than other fingerless gloves in this round-up, which I’ve found to be comfortable and provides even better blister protection. They have a unique two-layer velcro strap system that keeps them insanely snug. 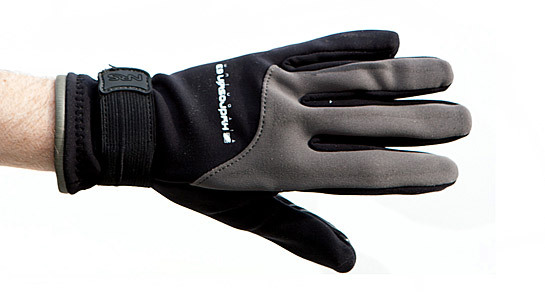 They are quite windproof and warm for fingerless gloves. They’re also stylin’ and match my Kokatat Expedition Drysuit! But no glove is perfect. 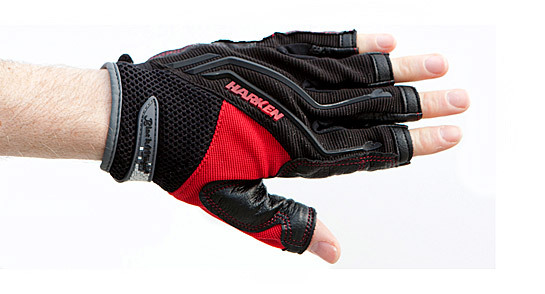 The Harken Reflex is over-adorned with aesthetic bits. They can be a little hard to get off when wet, especially for those of us that are getting knobby, gnarled old-dude knuckles. They run small, so get a size larger than you’d suspect you’d need. But they are undoubtedly the toughest-built gloves I’ve used on the water. They are also available in a full-finger version. 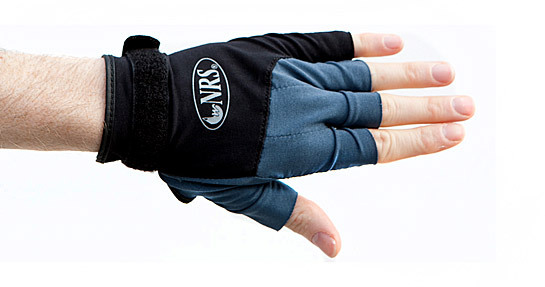 In my experience, the design of the NRS Hydroskin gloves represents too many compromises. The thin, porous neoprene provides no protection from the wind unless they are completely dry. Once your hands are wet, they feel like they practically accelerate evaporative cooling of the skin. I’m no dainty wallflower who never gets my hands wet when I paddle, so that’s no good. I wore them paddling and rolling on Lake Tahoe in December, and they only kept my hands warm on days when the winds were perfectly still. They’re quite stuffy in warm temperatures on still days. They do maintain a high degree of manual dexterity, due to the thinness of their construction. The NRS Hydroskin gloves are possibly the worst investment in handwear that I’ve made other than the Stohlquist Contacts (see above). I’d only recommend these gloves for fine-weather but cool paddling with little wind, or when your fingers need complete sun coverage. These massive, 3mm neoprene bad boys are for those seriously cold days. They’re amazingly warm, as their name and thickness would suggest, and have a terrycloth thumb patch for those runny winter noses. They are, hands down, the warmest gloves I’ve ever worn, and I’d strongly recommend them for extreme conditions on cold or frigid days. No amount of wind has made my hands cold when wearing these gloves. With warmth and thickness, of course, comes a compromise manual dexterity. The Anti-Freeze’s bulk becomes a liability when it comes to real-world rescues: Some kayaks have perimeter deck lines that are so tight that you can’t grasp them with these glove’s extra-thick construction. The construction is so burly that some glue beads can be felt inside the gloves’ fingertips, sacrificing comfort for some wearers. Kayakers, note to selves: Make sure your perimeter lines aren’t too tight! It might make your next rescue way easier and less frustrating for the swimmer. And wait, what? You don’t have perimeter lines? Add them, you lazy sod! Now, many people roll their eyes and say, “Come on, man, if you’re wearing something that thick, just wear mitts. They’re warmer.” That is undeniably true. But the lack of manual dexterity at that point is too much of an inconvenience. A friend of ours made us mitts based on this pattern on our kayaking club’s website after I saw a pair in action. 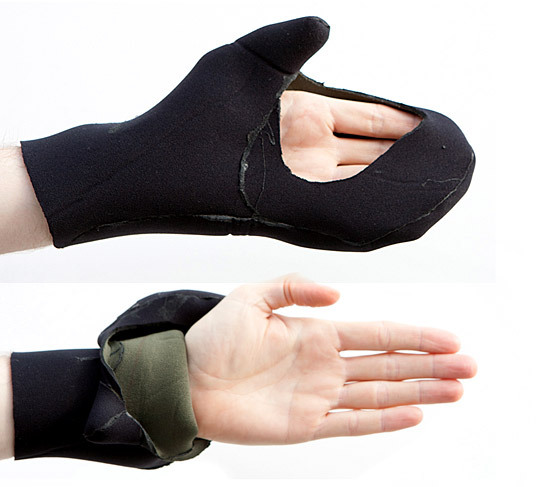 They were a revelation: Easy to pop your fingers into and out of, flexible enough to be rolled back out of the way, and their structure prevents them from flopping around, so you can have them cover the back of your hand for sun protection while your fingers are exposed. They’re wonderful for keeping hands warm above the water. Sure, they don’t protect your hands from cold water if you roll or capsize, but each finger warms the other and the neoprene helps prevent evaporative cooling. 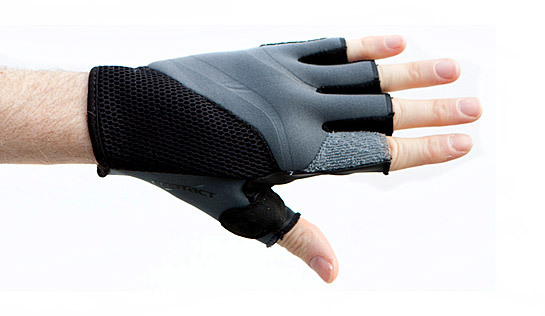 Palmless mitts provide that direct contact between your skin and the shaft of your paddle that many kayakers like. Personally, my hands feel a little tender from friction against the paddle after all-day rockgardening or surf sessions, and I find that gloves give me a more positive grip on synthetic shaft materials (e.g., carbon fiber) than bare skin. However, one can even wear fingerless gloves underneath the palmless mitts if desired! If you find gloves give you blisters, then the DIY palmless mitt solution is especially brilliant. I’m glad to have them in my quiver, even if I’m still a Glove Man at heart, especially if I need to have an extra layer in windy, cold conditions. Are you a glove hater? Have other gloves that you’ve loved? Pipe up in the comments below!